Parsi food sure is becoming super popular! Everywhere I go, people want to talk about the places they went to eat Parsi food and what they tried. S and I are both vegetarians who eat eggs but according to our friends, if you don’t eat meat you can’t fully experience the joys of Parsi food. I do agree with that because most of their diet is meat based and the way the cook the meat adds to the charm; but vegetarian eaters need not feel left out! There are quite a few things you can eat which are vegetarian or which have eggs. If you don’t eat eggs, I think you may have a problem! Parsis are a fascinating and very jovial community. If you haven’t lived in Bombay, your chances of interacting with Parsis is bound to be very limited. They have excellent English, are very good at theatre, have a very distinct fashion sense and possess the ability to laugh at themselves. Their culture is unique to them and Parsi weddings or festivals are wonderful to observe. 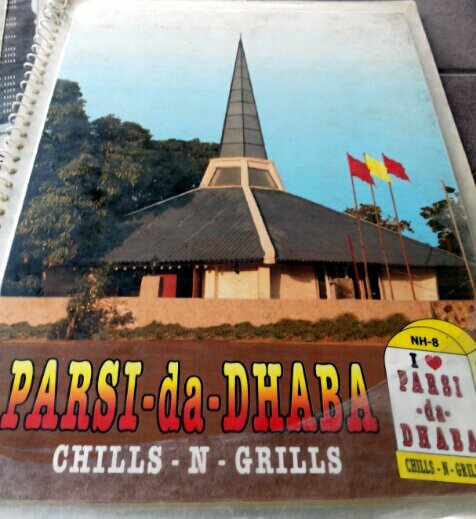 S and I were driving to Bombay this last weekend and when we told some friends about it, they said we absolutely must stop at Parsi da Dhaba. One of them even went as far as saying that the only way he would drive down to Bombay is to eat the food there. With such rave reviews how could we NOT go there? We weren’t sure exactly where it was but Google Maps sure knew it! Fortunately they have sign boards and ample parking space. We were not sure if we entered the right place so moved around a little precariously. The garden restaurant echoes the way a lot of fancier dhabas are. They have simple, brown plastic tables and chairs and huts erected. Its quite shady and since we went around winter time it wasn’t hot at all even though there were no fans around us. We were seated quickly and had our menus in front of us in a short span of time. Our friends had strongly suggested getting the ‘dudh nu puff’ and there were a whole lot of flavours to choose from including chocolate, rum and brandy. We settled for vanilla. I loved their menu because it had a little explanation and a brief background/story of the dish. Traditionally, the glass of milk is kept by the windowsill to cool through the night and is frothed the next morning so that it has a frothy top called puff. We weren’t exactly sure what this was so we decided to split one. 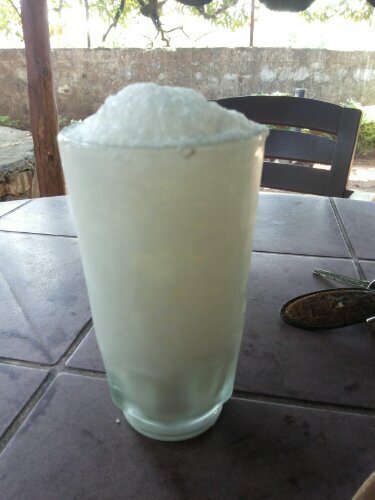 Its a small glass which is filled 1/3rd with sweetened and flavored milk. And topped with a huge puff. Its very light on the stomach and I can easily imagine having 3 or 4 of these myself! I am a huge French Toast lover and when we went to Gir recently, more about that in my next post, I ate French Toast every day for the 5 days we were there! 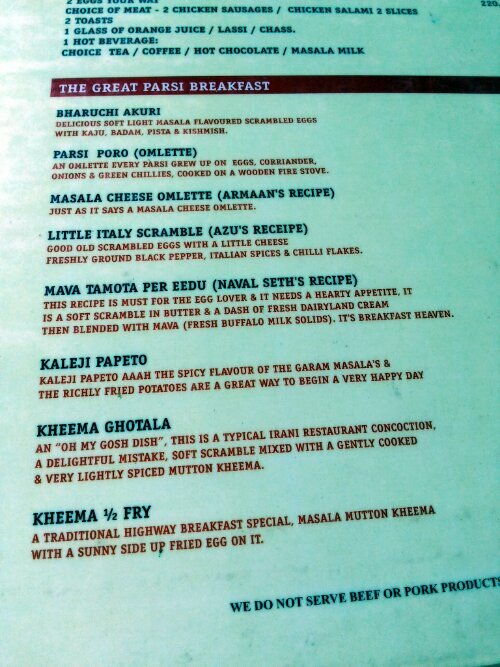 Parsi da Dhaba also had French Toast on their menu and the description said if you haven’t eaten French Toast their way you haven’t eaten it at all! Of course I HAD to try it.. It is served as 2 slices of bread covered in a golden eggy mixture. I tasted a hint of vanilla and it was sweet and moist enough that I did not need honey with it. Not bad, but not the greatest. I personally did not enjoy the bread and would have preferred if they would have used a slightly thicker bread. S wanted to eat Dhanshak but we were driving to Bombay abd he didn’t want to fall asleep at the wheel after eating the rice and Dhanshak. He settled on tamatu per edda or an egg on tomatoes. The tomatoes are more like a gravy and there is a fried egg on top of it. We had eaten papeto per edda or salli per edda which is an egg on potato chips, but our server said that the potatoes stick to the pan and this turns out much better. I love the Parsi tomato sauce! It has a different sweetness, not sugar but honey or jaggery. I’m not sure. And it is very subtle. You can still taste the sourness of the tomatoes but they have a good balance with all the spices. All in all it was great! 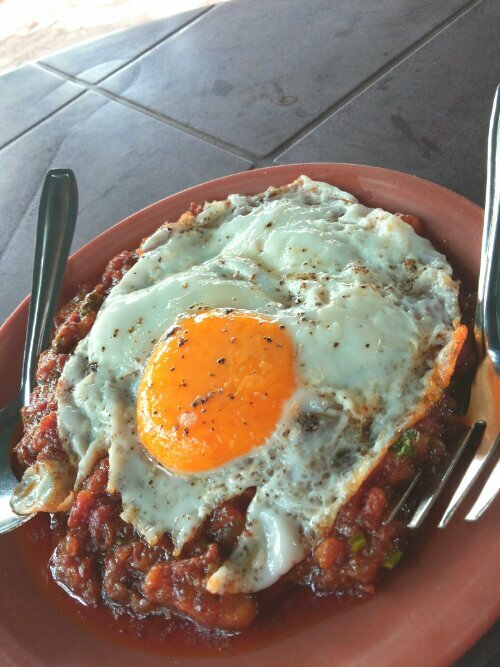 Parsi da Dhaba serves a great tamatu per edda with all the flavors balanced just right! The yolk is slightly runny and looks gorgeous with that golden liquid oozing out of it. S ate it with their rotis which are like homemade phulkas. They are light and have the sweetness that comes from wheat. Perfect accompaniment to this dish. I was still a little hungry since the French Toast wasn’t really that heavy. I decided to order some baked potatoes. They were beautiful. Covered and served in foil and thrown in the charcoal pit, they have a nice smokey taste. They are served with a little bit of pepper, salt and butter. Potatoes that amazingly satiate the need for carbs in a healthy way. Just as soon as I ordered the baked potatoes I stumbled upon aloo parathas in their menu. I don’t know why but I was craving potatoes terribly that day. After I made S swear that we would share the paratha with me, just so that I don’t feel lie a glutton, I ordered them. They came quickly and were piping hot. 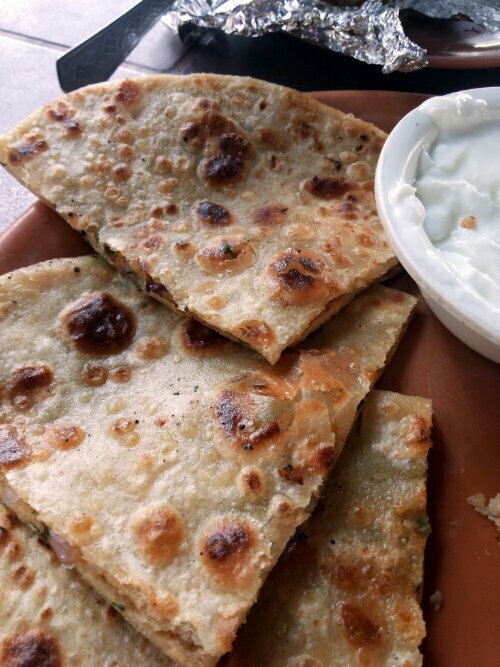 The aloo parathas were served with a side of curd which was thankfully not at all sour and was thick and creamy. I love my curd and hate it when restaurants serve sour and thin curd. The parathas were crisp, hot and obviously had a good amount of oil in them. They had an excellent filling of potatoes, onions, chillies and spices. Simple yet perfect. Judging by the parathas I would think that their Punjabi food would be great too! 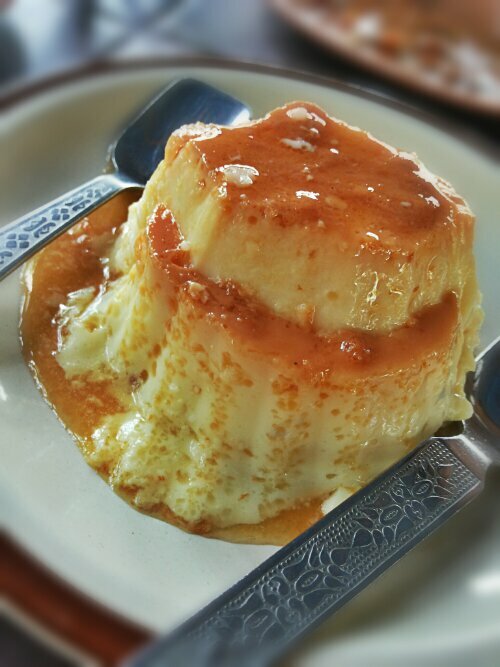 Besides Dudh nu Puff, the other highly recommended thing was the caramel custard. It was so delicious! Creamy, eggy, sweet with a hint of gorgeously caramelised sugar and it had air bubbles. Now I’m not really a fan of custards but this was very good. It wasn’t very heavy on the stomach for some reason so even though we had eaten so much, the dessert didn’t make us uncomfortable. We completely relished it and savored every bite. I can’t think of a better way to complete this meal. 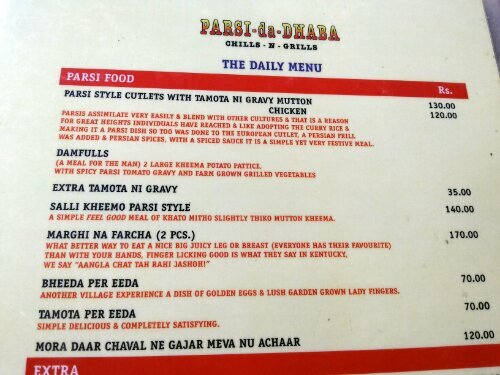 The menu at the Dhaba has a section at the back for information about Parsis for non-Parsis written in a very jovial and light hearted way. 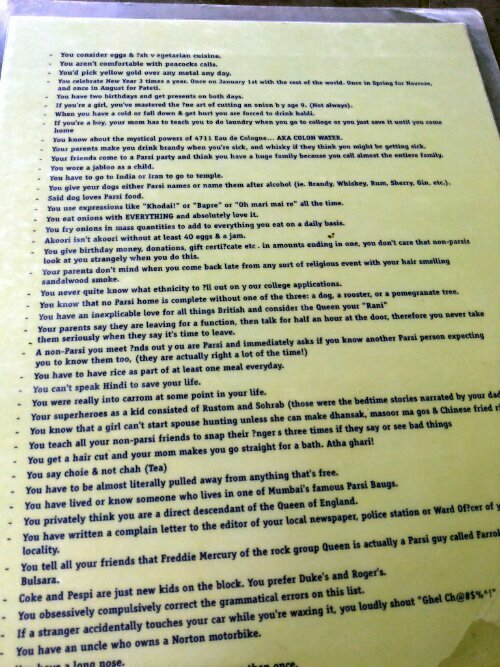 Its a delight to read it. Some of the facts I loved were – “You eat 30 eggs a day”, “If you have a tan then you are off the marriage market” and “You secretly think you are related to the Queen”. The service is quick, efficient and the place is very clean. Its nice enough to visit with family as well and we were surrounded by tables that had come with grandparents and all. The food is great and I’ve heard the non-vegetarian food is amazing! Its not too far from Thane and is worth a visit on Sundays for a long drive and some yummy food. This place is the prefect highway Dhaba and I can’t wait to take another long drive to Bombay just so I can visit here. 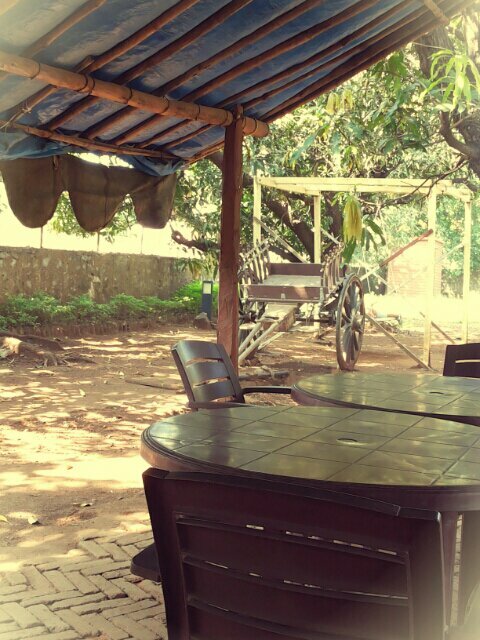 For good food, quick service, a clean restaurant and reasonably priced food, I give Parsi da Dhaba a 4 out of 5! Nice post! Unfortunately don’t eat meat or egg was wondering if you get veg dhansak anywhere. I don’t making a trip inspired by this post. I love veg dhansak a restaurant here was serving it but it shut down. You brought some memories by. I have visited this place several times (during school) on our road trips to Bombay (I am talking abt 90’s). We were too young to eat lot of their stuff (I don’t even remember how the menu was because our parents always took care of it). I remember their jumbo paneer rolls and toffees!. They have their own candy that is sold in packs. And we HOARDED them. Try them next time if they still have it.. I will definitely look for the toffees!Hopefully I’ll be going back soon and will have an update for you! :) The food is so yummy and I really look forward to trying something new..